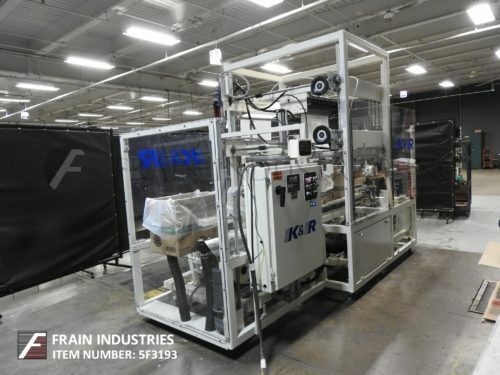 K & R, Model PBI32, automatic, case erector and bag inserter with bottom taper. Rated from 5 to 20 cases per minute – depending on materials, application and machine configuration. Case size range: 12" to 22" in Length; 9" to 16" in Width; 8" to 18" in Height. 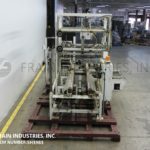 Equipped with a 72" long blank case magazine, suction cup vacuum pick and place, 116" long side gripper belt conveyor, minor flap closers, bag open / inserter with mechanical finger grips, air evacuation vacuum system to bring the poly bag flush with the five inner sides of the case, major flap folders, 2" bottom case taper, A/B PLC, push button controls. Mounted on base frame with Lexan safety guarding. 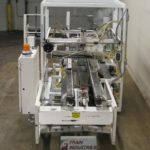 K & R Model PBI32, automatic, case erector and bag inserter with bottom taper, rated from 5 to 20 cases per minute – speeds depending on materials and application. Case size range: 12" to 22" in Length; 9" to 16" in Width; 8" to 18" in Height. Equipped with a 72" long blank case magazine, 3 suction cup vacuum pick and place, 108" long side gripper belt conveyor, minor flap closers, bag open / inserter with mechanical finger grips, air evacuation vacuum system to bring the poly bag flush with the five inner sides of the case, major flap folders, 2" bottom case taper, A/B PLC, push button controls, and Lexan safety guarding. 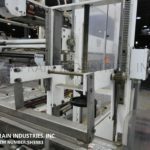 K & R, automatic, case erector, bag inserter, bottom taper, rated from 5 to 20 cases per minute – speeds depending on materials and application. Case size range: 12" to 22" in Length; 9" to 16" in Width; 8" to 18" in Height. 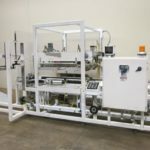 Equipped with suction cup vacuum pick and place, 120" long side gripper belt conveyor, minor flap closers, bag open / inserter, mechanical finger grips, air evacuation vacuum system to bring the poly bag flush with the five inner sides of the case, major flap folders, 2" bottom case taper, PLC, with control panel and Lexan safety guarding.